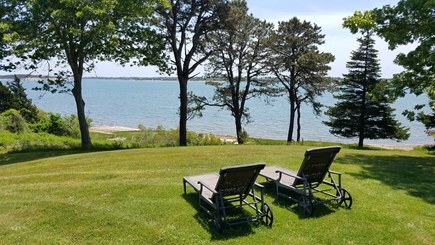 Our waterfront property on Pleasant Bay half way between the charming towns of Chatham and Orleans features 200' of private beach and overlooks the Bay and Chatham. 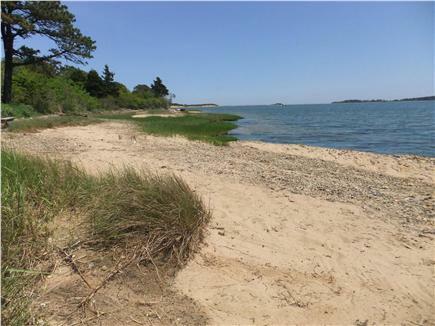 Sit on the deck, watch the boats sail by, swim at the sandy beach, tie your boat to the mooring, and enjoy the many wood land walks nearby. Please note - we have recently reduced our weekly rate by 12.45% as that is the new ''airbnb tax'' signed into law for all vacation rentals. Tax will be added to your payment schedule. Cleaning and linen service remains free of charge. The two-acre property with southern exposure is located at the end of a private drive in the estate area of South Orleans. Built in the 1950's with additions in the 1980's, the ranch style house has recently been renovated and features central air conditioning. 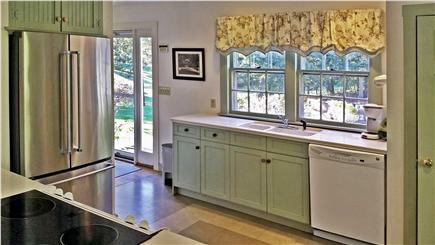 New Corian countertops, cabinetry, and appliances are featured in the kitchen. The house includes wireless internet access. The fireplaced living room opens to an expansive deck. The dining room is open to the kitchen as well as the deck. 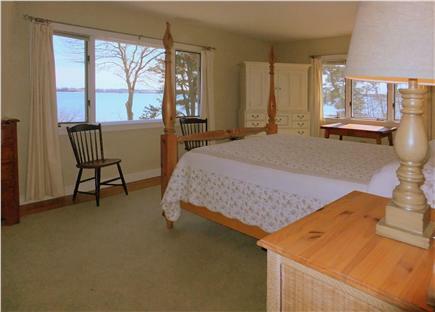 Of the five bedrooms, two are master bedroom suites with fireplaces and master baths. 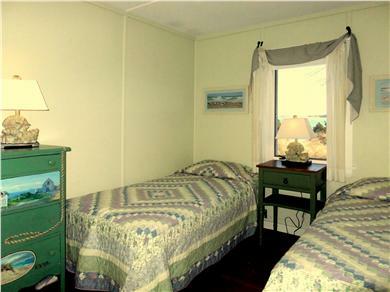 Two of the remaining bedrooms have sets of twin beds. The fifth bedroom has a set of bunk beds. 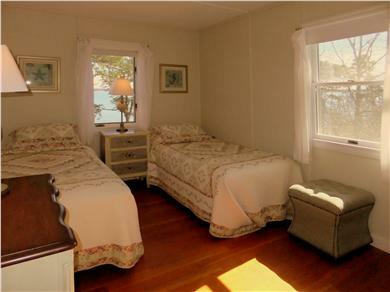 The twin bedrooms share a full bath. The five bedrooms are really five bedrooms - not common rooms that become bedrooms at night with pull out sofas. There are no sofa beds, futons, trundle beds, or cots. Washer and dryer are in a separate laundry room and there is an enclosed outdoor shower. Furnishings, bedding, and decorating are new throughout the house. Beach, bed and bath linens included. No cleaning fee or taxes or hidden fees. 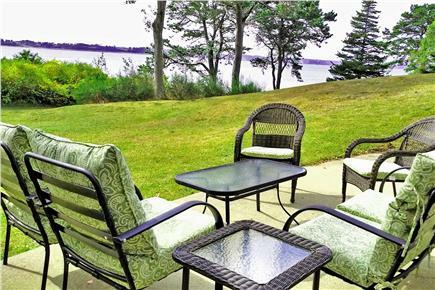 Enjoy the spectacular views from the house and deck. 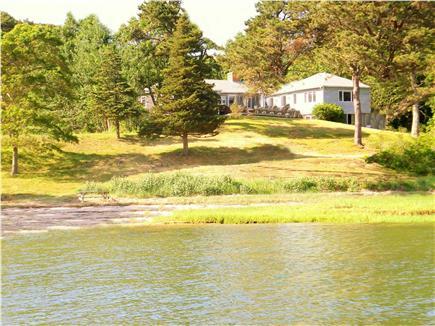 Walk over the lawn to the private beach for a swim or to dig clams for dinner. Enjoy the quiet, the sun, and the saltwater. The property is available by the week from June through September and by the week-end in the off season. It is closed from Thanksgiving till April. Except for one bedroom, all of the living space is on the first floor. 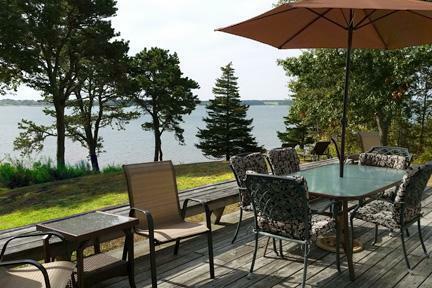 The expansive deck is wonderful to sit and enjoy the view or watch the activity down on the beach. Outstanding rental. "Couldn't ask for more." A must have for any event! Our family had a wonderful time at this beach house. The house itself is modernized and has an open design. We loved both grilling out on the deck and cooking in the kitchen. The living and dining rooms were well laid out and spacious for our family to talk, play games, or just relax and read. Having linen service for bedding, bath towels, and beach towels was great and made packing so easy! We enjoyed the outdoor spaces everyday. The large backyard was great for the kids to run around and play games. They especially enjoyed being about to use the outdoor shower. The bay water beach was perfect for our younger swimmers since the water was calm and refreshing but not cold. We rented Gentle Heritage and its accompanying guest house for a once-in-a-generation reunion with a clan of 28 and had an exceptional time. The property exceeded expectations in all regards. 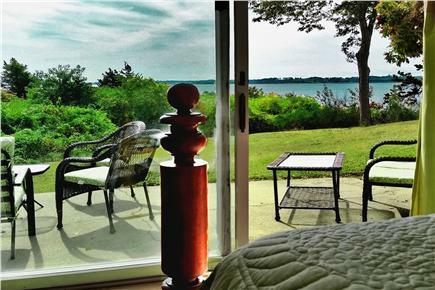 Spacious, beautiful, very comfortable, in great shape, and with unparalleled views and setting. Owners were incredibly gracious and easy to work with. This has our highest possible recommendation! We have rented this property for over ten years and stopped only because our family circumstances changed. Otherwise we would have gone on forever. We loved our stay at this property. 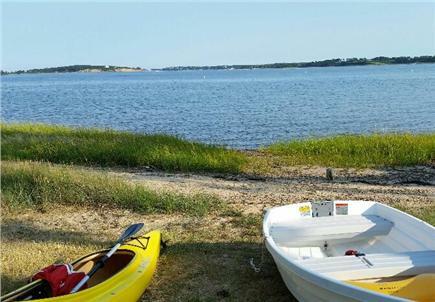 The house is beautifully sited in a quiet location with an incredible view of Pleasant Bay and with access to a small private beach. 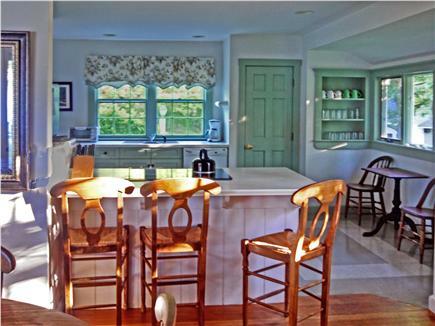 The property is well maintained and suitable for large families. It would be impossible to find a more delightful location in Orleans. Just returned from a long weekend stay here. This house is perfect! Cozy, yet spacious. Clean, well equipped, great view, quiet, peaceful. Room to spread out, yet plenty of space to be together. Hesitant to write a good review, because I want to be sure it's available for me to rent again! Thanks to the owners, who were wonderful to work with.